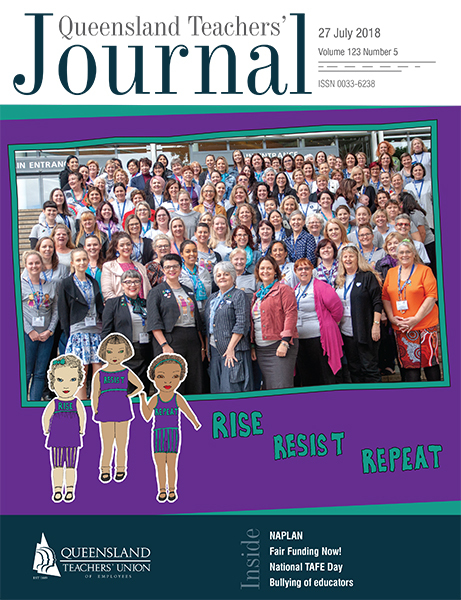 The Anna Stewart Memorial Project (ASMP) is a work-shadowing initiative coordinated by the Queensland Council of Unions which enables women activists to engage with their own union and visit and work with another. Here the 2018 QTU participants, Amanda Tu and Beck Humphreys, share their experiences and discuss what they learned. Amanda Tu: All unionists have their “story”. My union story began with my late grandfather; listening to stories from his time with the Printers’ Union and their significant achievements over time. I had a great unionist role model in my grandfather, and through my activism within the QTU, I was desperate to know more about the union movement in Queensland. The Anna Stewart Memorial Project (ASMP) provided me with the opportunity I yearned for to learn and grow as a woman activist. During the first week I met everyone who works for the QTU in Milton, and now better understand various roles and responsibilities. I met the fellow “Annas” from other participating unions, and spent three days with National Union of Workers (NUW). Early starts and late finishes afforded plenty of time to meet members of the NUW and support them during a national day of industrial action. The second week was spent shadowing QTU Executive, Senior Officers, Organisers and members of the secretariat. We were in schools meeting with principals, QTU Reps and members, conducting Fair Funding Now! ballots and finding the next recruit. Highlights included working with my fellow 2018 “Anna” Beck Humphreys, visiting TAFE and contributing to the Gender Equity plan and a draft joint statement. The ASMP is a phenomenal once in a lifetime opportunity. Will you be the next “Anna”? Beck Humphreys: The Anna Stewart Memorial Project has changed my understanding of the union movement, how I think as a Union Rep, and how I think about my membership of the QTU. Our QTU is full of amazing dedicated and passionate individuals who work tirelessly to help members. Their passion is inspiring. Their dedication is motivating. Their compassion is moving. The ASMP builds confidence, understanding and passion in the broader union movement. My time at the Services Union taught me that the commitment to members extends past the QTU. The Services Union (the Australian Municipal, Administrative, Clerical and Services Union, Queensland Branch) serves members with dedication, zest and energy - whether by visiting local workplaces (such as Ipswich City Council), representing members at a Fair Work dismissal case or creating innovative member strategies to show that the Services Union cares and will always fight for the rights of their members. My time with the QTU demonstrated time and time again that members and member issues are front and centre. The QTU demonstrates this passion for members through school visits, principal breakfasts, conference information tables, late night meetings, first class information sessions, as well as internal meetings such as workshopping the NAPLAN joint statement and tracking data to help schools achieve fair funding through the Fair Funding Now! campaign.